LionsDeal > Furniture > Restaurant Furniture > Menu & Information Displays >< Menu Covers > Thunder Group PLMENU-4 4 Page Book Fold Clear Menu Holder 8-1/2" x 11"
Thunder Group PLMENU-4 4 Page Book Fold Clear Menu Holder 8-1/2" x 11"
Present your menu items in the Thunder Group PLMENU-4 4 Page Book Fold Clear Menu Holder 8-1/2" x 11". Made with four dual sized pages, this menu book can be used to display eight pages of menu offerings while its laminated surface will protect it from stains and spills. Designed with a black border, this menu holder is suitable for all types of restaurants and its reinforced corners give it extra durability. 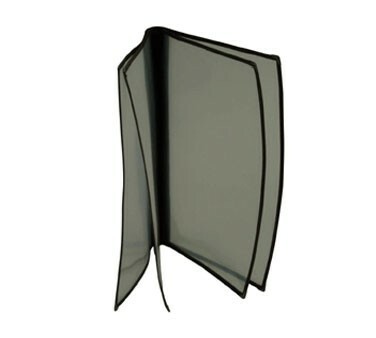 In addition, it has a crystal clear surface that provides excellent visibility and will not get torn from heavy use. Four page clear menu leaves me enough room to put everything on my menu in big font! Plus it gives the impression that we have tons of options.